The other day someone was asking a lot of questions on StackOverflow about how to work with wizards in wxPython. You can read the two original questions here and here. The code we’ll be looking at in this example is what I used to answer the questions on Stack. The primary question was how to disable the Next in a wxPython wizard. How do you disable the Wizard’s Next Button anyway? Let’s break this down a bit. The first class we’ll look at is MyWizard, which is where all the action is anyway. MyWizard is a subclass of wxPython’s Wizard class. In the __init__, we create a page and we find the Next button so we can disable it. 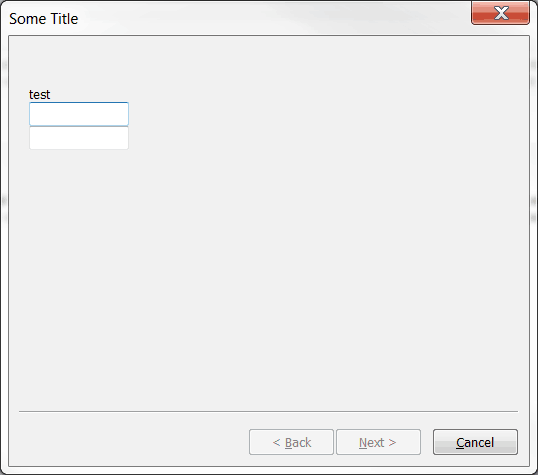 Then we create and start our timer object while binding it to the onUpdate method. Finally, we run the wizard. When we create a wizard page, we instantiate the WizardPage class. That class is actually pretty self-explanatory. Anyway, we end up creating several widgets that we place on the wizard page. The only other interesting bit is in the onUpdate method. Here we check to see if the user has entered data into both of the text controls. Here we never stop the timer. Instead, the timer is constantly checking the values of the text controls and if it finds that one of them doesn’t have data AND the next button is enabled, the handler will disable the button. Disabling the Next button in a wxPython wizard isn’t particularly hard, it’s just a bit convoluted. It would be nice if the API for the Wizard widget allowed a bit more access to the standard widgets it creates. However, now you know how to work with them and change their state. Use this knowledge wisely!